Upon arrival you will be met by your tour guide and driver and head to your hotel in the great city of Santiago de Compostela, the city of the apostle. Dinner and overnight in Santiago de Compostela. 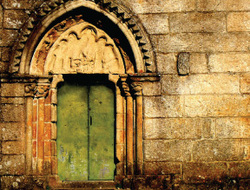 Today you will begin with a visit to the Cathedral of St. James, the center of Santiago de Compostela. The route to this church from points across Europe was known as the Way of St James, and it has existed for over a thousand years. It was one of the most important Christian pilgrimages during medieval times. 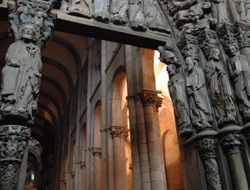 Here you will have the opportunity to climb the stairs behind the high altar to visit the crypt where the relics of St. James are preserved, touch the central pillar (Portico de La Gloria), view the 'botafumeiro' and admire the wealth of medieval art inside the Cathedral, before visiting the cloister museum. Dinner and overnight in Santiago de Compostela. After breakfast you depart, stopping first in Pontevedra where Our Lady and the Child Jesus appeared and spoke to Sister Lucy of Fatima asking for the 5 First Saturdays Communion of Reparation. It was in the nearby town of Rianjo, where Sr Lucy received a warning from Jesus for the bishops that the plight of the King of France would befall them for delaying the proper consecration of Russia to the Immaculate Heart of Mary. Continue on to Tuy to visit the convent where Sister Lucy received the vision of Our Lady and the Most Holy Trinity commanding the Consecration of Russia, and where she wrote the words of the Third Secret. Stop in Porto for lunch before continuing on to Santiago for Dinner. Depart Santiago de Compostela for flight home.